Does your auto insurance provider give you a discount for completing a defensive driving course? 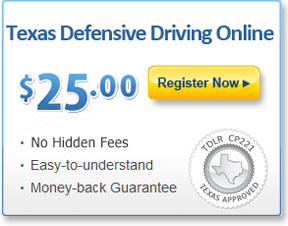 This Texas Defensive Driving course can be used to complete requirements set by your insurance carrier. Saving money on your auto insurance premiums doesn't get easier than this. You already have enough to worry about your life. Between work, family, and taking care of responsibilities you don't need another thing to make your schedule more complicated. That's why this Texas defensive driving course is 100% online. You get the convenience to decide when and where you choose to study. No matter what time or place works best for you, this course will always be available. If it has been a long time since you last took a driver's education course, our defensive driving program is a great way to remember the essential facts of safe driving. You will learn crucial information like the traffic laws in Texas, driving strategies that help you avoid accidents, and how to handle hazardous road conditions. You won't just get a Certificate of Completion that can help you save money on car insurance; you will also get an education that you can use to avoid future tickets and accidents. 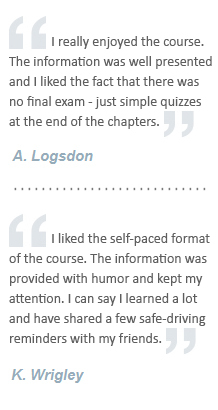 We believe in giving the best driver's education in the easiest format possible. That's why we include simple and short chapters, cool 3D animations, and even an optional audio read-along feature that guides you through every unit. Everything about this course is built to make the experience as effortless as possible.